"Dear candidates, hello! You have been selected by the Ministry of Entertainment to participate in our fabulous game show! Broadcast globally, you will be able to delight millions of viewers in surviving the deadly traps of our playful complex! You have very little time to get out. Let's go ! And smile, you're filmed! " 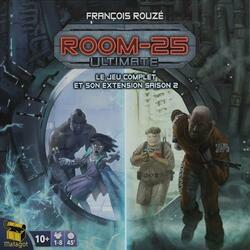 Room 25 Ultimate is: hidden roles for a good dose of suspicion, a game of atmosphere, tactics and epics, but also 2 game modes and 2 levels of difficulty!